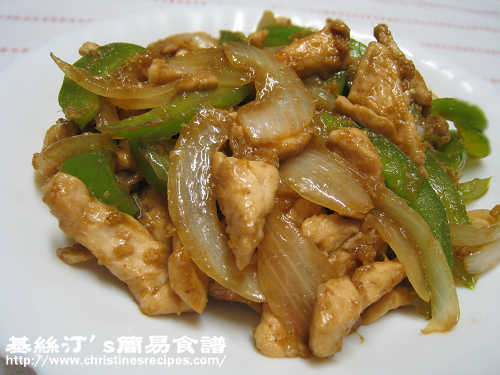 This dish is very like Japanese cuisine, actually evolved from the previous recipe, Japanese Pork Chops in Ginger Sauce. This recipe calls for hashed ginger, not grated ginger sauce, that would make chicken fillet much more unique in taste. You can use ginger sauce if you don’t like it too hot in taste, of course. Skin and trim fat from chicken breast fillet, rinse, wipe dry and cut into lengths. Stir in marinade and leave for 20 minutes. Heat 2 tablespoons of oil to sauté onion until translucent. 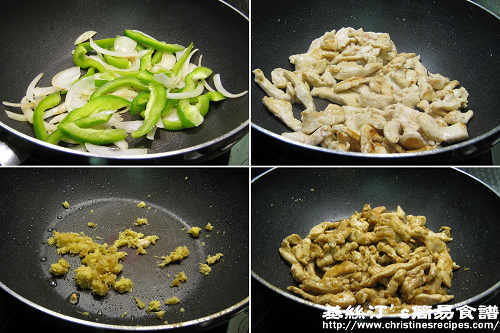 Add capsicum and cook until tender. Sprinkle salt to taste. Set aside. Add more oil to pan over medium heat to sauté chicken till almost done. Remove, let sit on kitchen towel to soak up excess oil for later use. Heat 2 tablespoons of oil to sauté hashed ginger. When you smell the aroma of ginger, toss in chicken fillet, sprinkle wine and pour in seasoning mixture, add onion and capsicum. Cover lid to stew ingredients for 1 minute until cooked through and sauce dry up. Dish up, serve hot. Oh, you're so kind to leave a message like this, very encouraging. Thank you. Oh, my gosh... I just ran across this recipe while looking at images for chicken dishes on Google, and I must say it looks & sounds delicious! I'm bookmarking this page so I can come back this Saturday and make this dish... I have no doubt whatsoever that my daughter & I will love it!